After having a really great experience at Turner Field in Atlanta, we crossed the Florida Georgia Line (pun intended) to drive to St-Petersburg to visit the Rays. We will make this clear right away: yes we heard the rumors about the Rays coming to Montreal. Our objective is to bring back Major league baseball to Montreal. We do not target a team in particular. Personally, we don’t want any baseball fan to live what we had to go through in 2004 in Montreal. 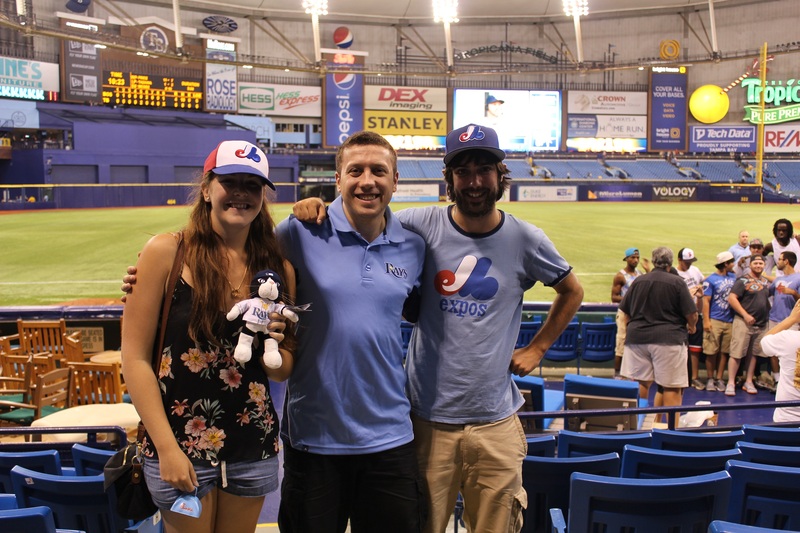 We got to St-Petersburg to learn about the Rays and their fans. We had the chance to meet, in St-Petersburg, Annette and her husband Jerry. 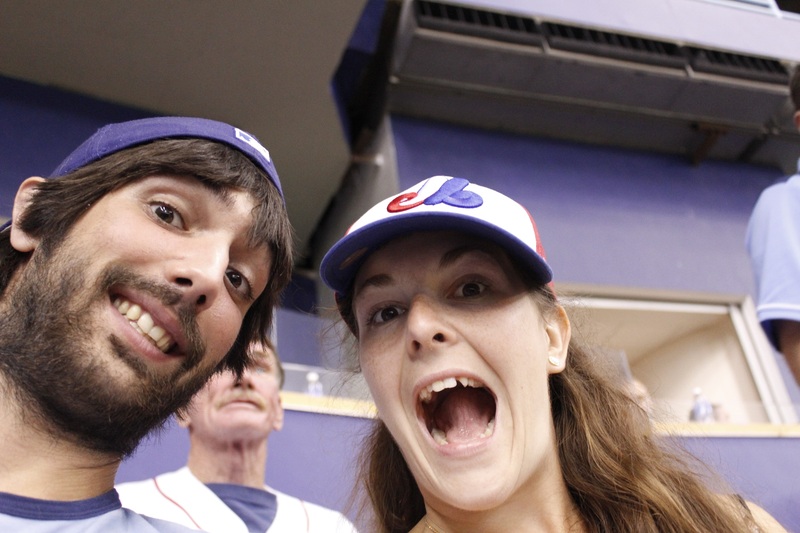 They are Rays fan and they also have a place in Montreal (they call themselves ‘’reverse snowbirds’’). They offered us lodging for the two nights that we were spending in St-Petersburg. They also are season tickets holders so they really know their baseball and their Rays. So we personally took the time to ask a lot of questions about baseball and specially the Rays situation. The team is really young. Being part of the MLB team expansion in 1998, the team is not even 20 years old. Annette considers that the young fans that grew up with the team are not hold enough to buy season tickets or to come to games on a regular basis. 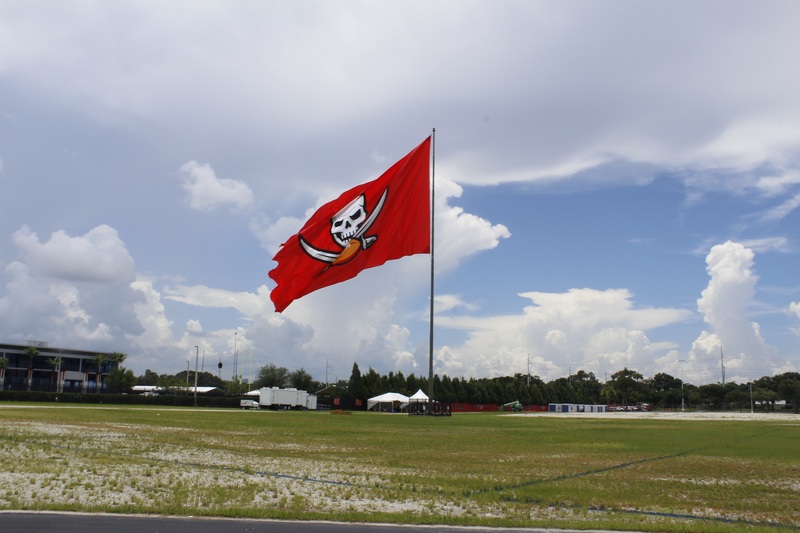 We understand that we have to give enough time to the team to find a stable fan base. The financial crisis was really hard on the Floridians. It is a place where a lot of person got foreclosure on their houses. Like it happens at every financial crisis, professional sports get it really hard because citizens can’t afford to spend money on Baseball, hockey or football. 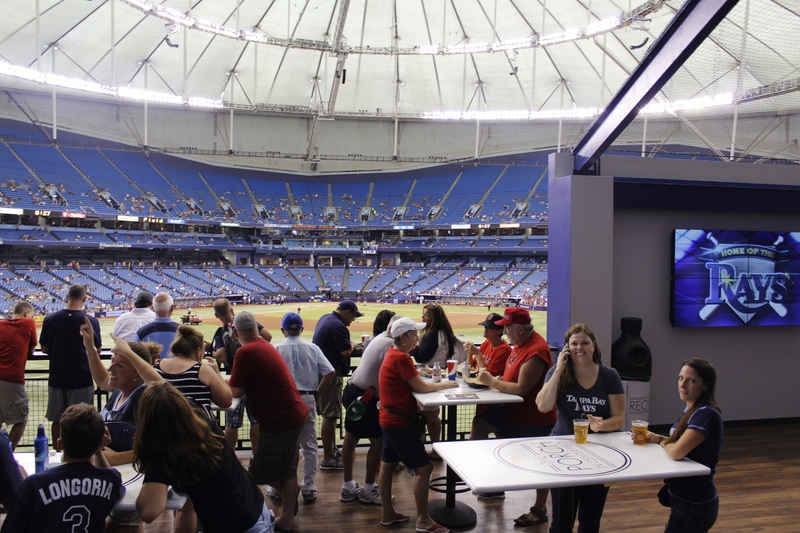 Rays have seen a number of fans that couldn’t renew their season tickets packages. Television is a major problem with the Rays. The Rays get some got some excellent TV ratings. The thing is that a lot of Floridians prefers to stay at home and watch the game on TV with all the angle and replays. Also they don’t have to get through the trouble of going to the ballpark. This is a reason of the low attendance at Tropicana Field. The bay is also a problem. We are also familiar with this problem in Montreal (North shore, South shore, etc.) For those who don’t know Tampa, go on Google maps and check where Tampa bay is and where the Tropicana Field is. Tampa citizens must cross a bridge to go to St-Petersburg and see a game. A lot of them will prefer to stay home and watch it on TV (see problem 3). There are a lot of rumors for a new ballpark which would be in downtown Tampa Bay. A lot of problems we have to say. We all have in mind the past few years where the Rays had an awesome team on the field and headed to the playoffs with an almost empty ballpark. No worries there are a lot of positive things about this organization and we’ll talk about it later! Game day we met with Jake Murad, a graduate from John Molson School of business in Montreal that is doing an internship for the Rays: he works promotions and social Medias. He offered us to tour us around Tampa and St-Petersburg and we would also attend the game with us. 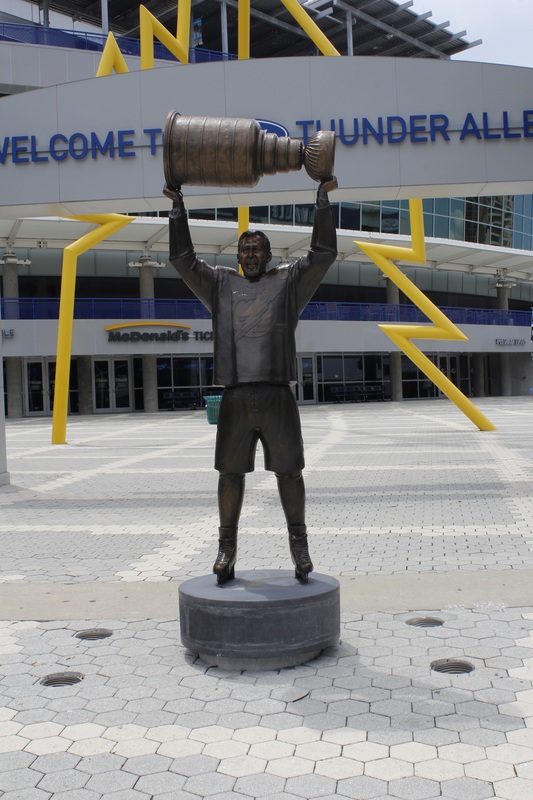 We cruised around Tampa and Jake showed us a few things: Tampa bay Lightning arena, Rays store, Raymond James stadium (Buccaneers), George Steinbrenner Stadium (Yankees minor league team) and we definitely had to stop to play mini golf! Right after, Jake took us to the Tropicana field to give us a tour of the ballpark. 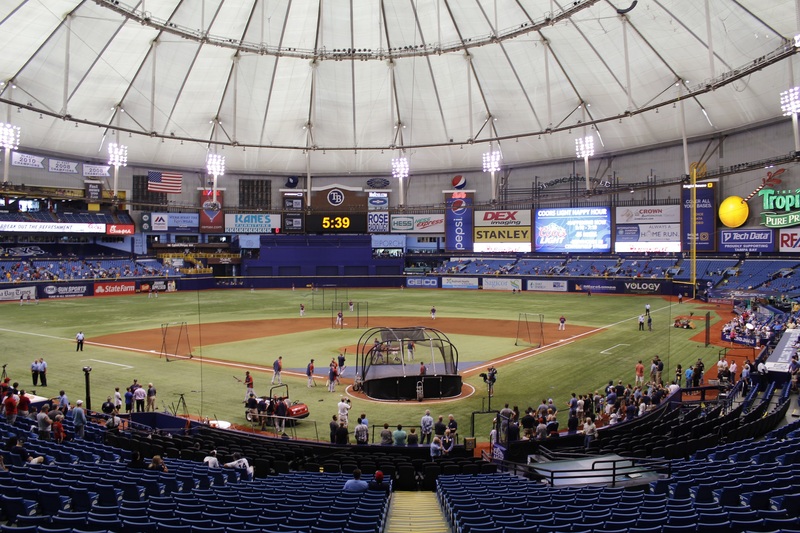 Tropicana field is a domed stadium covered with an Astro Turf (artificial grass). It is the last MLB ballpark that is domed. We already talked about the head and the humidity in Florida so a ballpark covered is an advantage. On the other side, as we seen it in Montreal, a ballpark with a roof loses all the glamour and the beauty of a ballpark. Especially after we visited the PNC Park (Pittsburgh) Camden Yards (Baltimore) and Turner field (Atlanta). Those are three ballparks that offer a nice view of the city surrounding the park. Inside, we could say that they didn’t put too much effort on the decoration. The main lobby is nice, you can see big pictures of the players and cheerleaders are welcoming you. 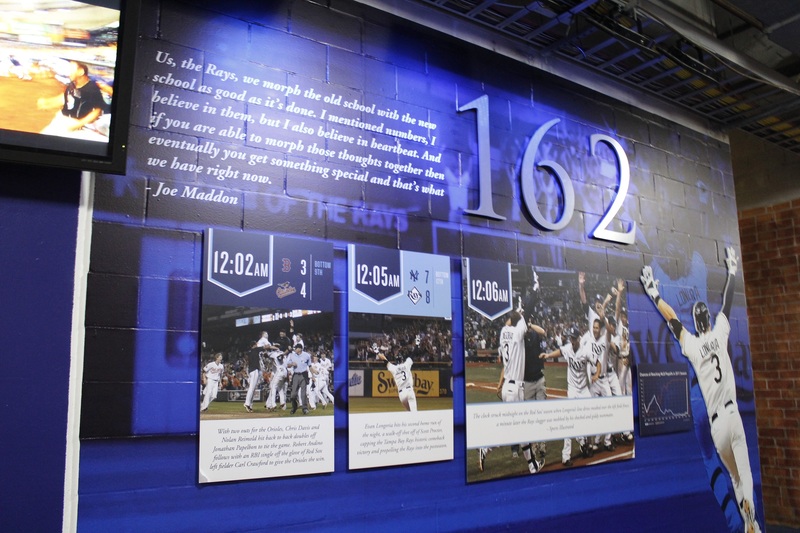 On the first level, walls are decorated or painted to the rays colors. It’s the same thing on the 3rd level except for a part that is made to loke like Ybor city, a part of Tampa bay. 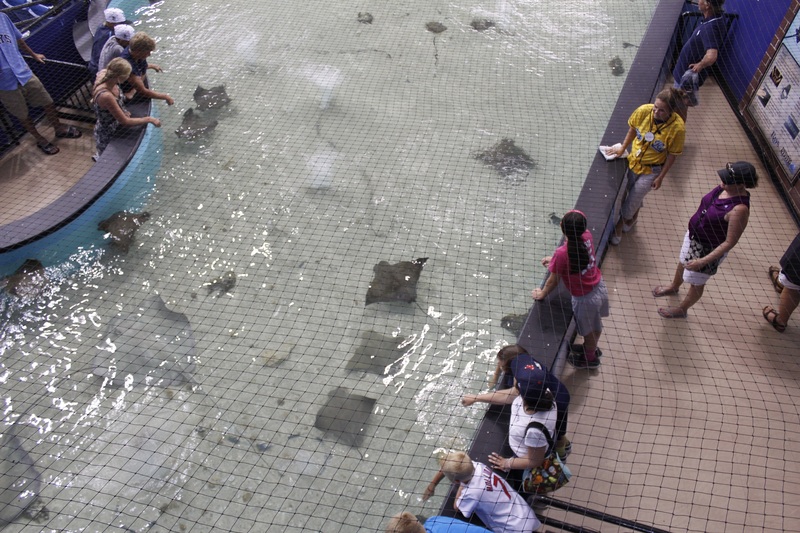 We could find a few attractions for kids, one of them being a touch tank where kids could go touch actual Rays! The ballpark also got a few attractions like the Porch, a big bar in center field where a lot of people were spending most of the game drinking and having fun! One of the attractions we loved in the trop was the ‘’landing 162’’. In 2011, the Rays had to hope for the Red Sox to lose their game in Baltimore and they had to beat the Yankees in the last game of the season. Losing 7 to nothing, the rays started an epic comeback. At their last strike, Dan Johnson hit a home run to right field tying the game 7-7. The Red sox went and lost their game in Baltimore 4-3. 3 minutes later, Evan Longoria hit a home run in the 12th inning and the rays were heading to the post season games! Rays are really proud of this game and they create a special section for the fans. You can also read about all this game and see the highlights before heading into that section. While we were walking around the ballpark, Jake showed us a section where you can see through an outfield fence and have a nice view of the field (similar to the bleacher bar in Boston). 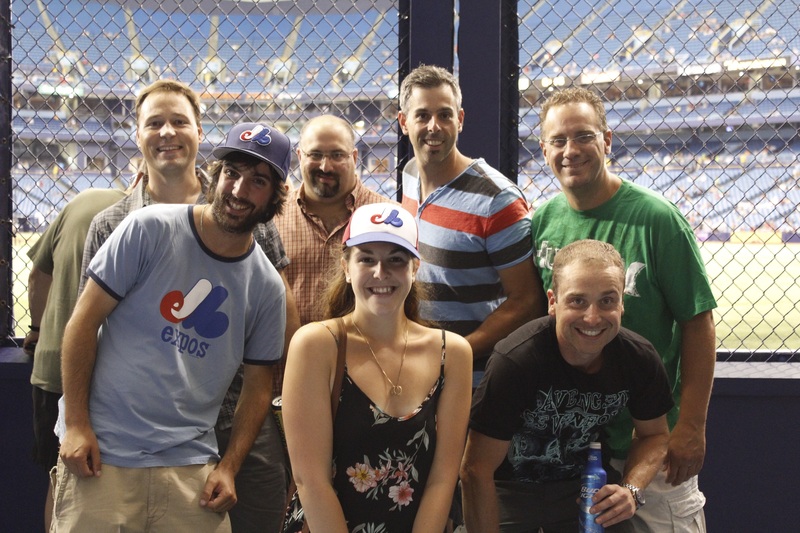 We randomly met a group of Quebecers that were also visiting the Trop. They recognized the expos gear and asked if we were the two montrealers going around all 30 ballparks this summer! These fans also try to visit all MLB ballpark going one per year. We wished them a nice trip and hope they enjoy the game as much as we did! Jake got us really nice tickets behind home plate. It was a change from our usual seats in the grand stand. The Rays were battling the Red Sox on this Friday night. For those who don’t know, the Rays and the Red sox got a few ‘’problems’’ with each other’s earlier in the season. When the Rays visited Fenway Park, the P.A. was playing kids songs during their batting practice. The Rays responded passive aggressive by not playing any music during the Red Sox batting practice! It was a long awkward silence. Right when the game began, we realized how much the Rays fans hated the Red Sox! There were a lot of Red Sox fans attending the game but the Rays fans showed up in great numbers. Attendance was over 23 000 fans. At his first at bat, David Ortiz got booed generously by the Rays fan. He got it even more when he argued with the Umpire on a strike call. Let’s say there is a big ‘’love story’’ between him and David Price. Talking about Price, he was facing Jon Lester, two great pitchers for this game. Many fans told us that it might be the last game Price could be starting for the Rays. Thing is they might not be able to afford him with a new contract so he might be traded soon enough. David Price got a pretty nice game with 10 k’s. In the 5th inning, Desmond Jennings gave the Rays a 2-1 lead on a home run. Red Sox took back the lead right away with back to back singles. After tying the game in the 7th inning, who else but Evan Longoria to hit a huge double to left field to empty the bases and score 3 points when he was facing Junichi Tazawa. The final score was 6-4 (and we are now 5 wins and 3 defeats). The atmoshphere at the Tropicana field was really surprising. Let’s say that the rivalry between the Rays and the Red Sox and the fact that the game was a Saturday night really helped that. 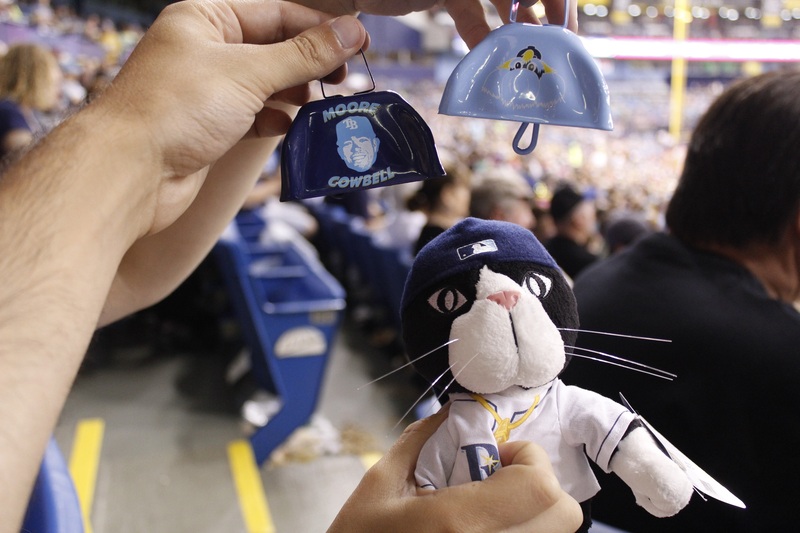 We were introduced to the famous Rays cowbells (our video here). Jake told us that those were introduced to the fans because, when they visited the Trop, the Red Sox and Yankees fans were too loud so the team made sure that their fans would make even more noise. 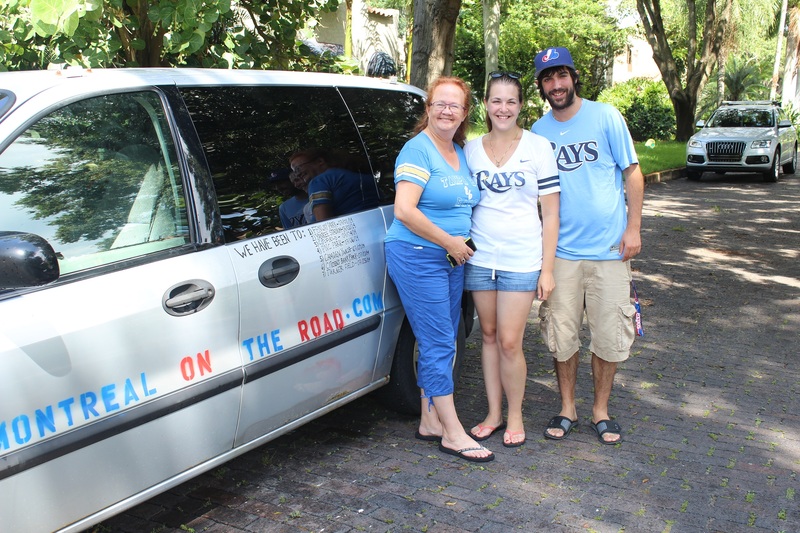 We met up with Annette, her husband and a few of their fellow Rays friends. They are all really active on twitter and it is really nice to see that there is friendship and solidarity between the Rays season tickets holders. It is something that we didn’t see at every ballpark. We could say that most of the time, the medias are giving us a really bad image of the Rays and their fan base. By visiting them, we realized that they don’t show all the facts and we could find a lot of positive about those fans! Jake also told us that only 22% of the Rays fans are living less than 30 minutes of the ballpark, which is the fewest in all of the MLB. We got one question: is this number going to increase if the team gets a new ballpark on the other side of the bay in Tampa? 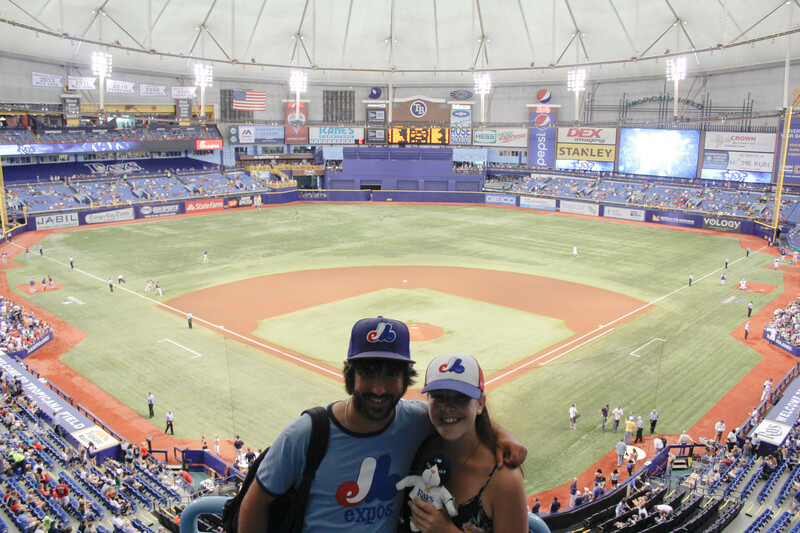 There are a lot of questions going around the Tropicana field and, being from Montreal, we know that feeling! After the game, Jake took us out to Central Street, the downtown of St-Petersburg. We took a few drinks and we even saw some of the Rays players walking on the streets! Our stay in Tampa was excellent. It was hot in humid so we were lucky to stay under a roof and to have AC. Annette and Jerry received us like royalty. What a pleasure to stay with fans we thank them very much. If you want to know everything about the Rays, I strongly suggest that you follow Annette on Twitter: @abaesel2. We hope to see them soon enough in Montreal. We would also like to thank Jake so much because he took the time to take a day off and take care of us for the whole day in Tampa and to give us a tour of the Trop. He also gave us some awesome Ray’s goodies! So we give him a big thank you and we hope to see you soon in Montreal (we think that he miss the Montreal Night life!). Good luck with the end of your internship! We are leaving Tampa with a big smile on our faces and we drive towards Miami. We have a few people to meet out here but we will keep the surprise until then! Again we like to say thank you to all our supporter, thanks for following us and believing in our project. We are learning so many things out here and we are really having fun. We are not giving up and we keep on going! P.P.S. I totally forgot to give you a Post Scriptum in Atlanta so here’s one: Did you know that in Atlanta you can find the biggest Drive in restaurant in the world: Varsity. The capacity is 600 cars! Varsity serves a great chili dog and also a delicious Frosty Orange!